Piracy is not all that bad for musicians. In fact, research has shown that less popular artists actually profit from piracy. This can be concluded from, and is supported by several studies. Frustrated as they are, the music industry claims that they lose millions a year due to piracy, but is this really the case? 75% of all artists profit from filesharing. Several studies have shown that most artists actually profit from unauthorized sharing of files. They sell more albums because people have the opportunity to download songs and entire albums for free. A study by Blackburn (2004), a PhD student from Harvard, found that the 75% of the artist actually profit from piracy. Blackburn reports that the most popular artist (top 25%) sell less records. However, the remaining 75% of all artists actually profit from filesharing. 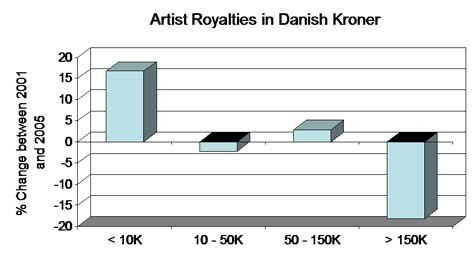 The same pattern was found by Pedersen (2006, see graph), who analyzed the change in royalties paid by the Nordisk Copyright Bureau between 2001 and 2005. But why do these artists sell more? Well, there are a couple of possible explanations. Music from highly popular artists is widely available on filesharing networks. If pirates mainly download albums from these artists, they will have more money left to buy albums of less popular artists. People have the opportunity to discover new music for free. It is thus easier to find new, and less popular artists. It is likely that people will buy albums from these artists as well if they like what they hear. It is not only piracy that makes it easier to discover new artists, social music services like Last.fm and Pandora also contribute to this phenomenon. The rise in income from concerts shows that the interest in music is increasing instead of declining. The increased album sales in the late 90’s may very well have been caused, at least in part, by the shift from cassettes and LPs to CDs (and not just piracy!). CD players were getting more and more popular and a lot of people were exchanging their LP collections for CD collections. After 2000, CDs were not that special anymore, and the number of albums sold normalized (see graph below). It’s also likely that the decline in CD sales was influenced by the increased popularity of DVDs and MP3s. The results indicate that transition from LPs to CDs might describe the increase in music sales during the 1990’s. the period 1995-2000 represents a truly unique situation in the modern history of Danish record sales and 10 million units sold in 2004 is more likely a return to regular conditions than a sign of crisis. 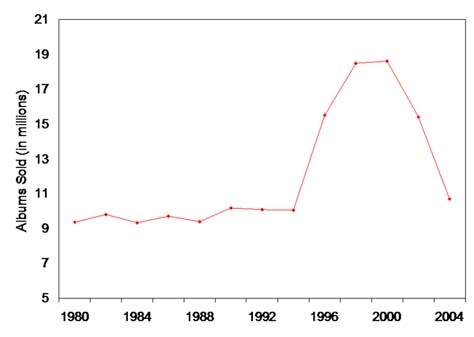 This graph plots the number of albums sold in Denmark, and shows that the decline in sales after 2000 is not that special, but the uprise in the late 90’s is (Source: Pedersen, 2006). Like we mentioned before, the Internet opened up a ton of possibilities for people to discover new artists and music. Not only illegal downloads, but also legal downloads, or paid downloads with the possibility to preview songs make it easier to discover new artists. Social communities, and music services like Last.fm and Pandora also play a big role in the evolution of our music experience. Before the Internet, people had only a few possibilities to discover new music. Friends, radio stations and record stores are three of them, where the last two are in part sponsored by the marketing campaigns of the music industry. Today people are less dependent on what the music industry is campaigning for. Wait a minute… the music industry and the RIAA always say that they are losing huge amounts of money because of filesharing. Isn’t this true? The basic result is that online illegal file-sharing probably has some negative impact on traditional sales but the effect is appears to be quite small. The size of this effect is debated, and ranges from 0 to 100% of the sales decline in recent years, but a figure of between 0 and 30% would be a reasonable consensus value (i.e. that file-sharing accounted for 0-30% of the decline in sales not a 0-30% decline in sales). At the same time there is still substantial disagreement in the literature with the most impressive paper to date (Oberholzer and Strumpf 2005) estimating no impact from file-sharing. One of the things we can be pretty sure of is that the music industry is starting to lose control over their customers. A great deal of their income was generated by overly promoted albums and artists. It are those artists and albums that suffer the most from piracy. It gets harder and harder for the music industry to market artists to the top position of the charts now the customers heva all kinds of alternative ways to discover new music. In conclusion we could say that music is more alive than ever before, that piracy is a tool to build a fanbase, and that the times when the music industry could dictate what we were listening to are over. Blackburn, 2004. Online Piracy and Recorded Music Sales. Hong, 2004. The Effect of Napster on Recorded Music Sales: Evidence from the Consumer Expenditure Survey. Oberholzer & Strumpf, 2005. The Effect of File Sharing on Record Sales An Empirical Analysis. Pedersen, 2006. On Danish record sales and Filesharing. Pollock, 2006. P2P, Online File-Sharing, and the Music Industry. c There are 32 comments. Add yours?